K. J. comes to EIC as our first Church-Planting Missionary. Before coming to us, he and his family helped plant a church in the North of England (Grace Church, Boroughbridge). 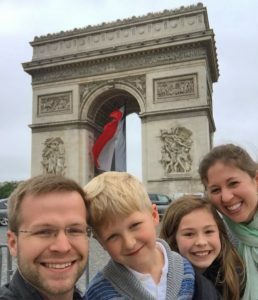 K. J. earned an Advanced Master of Divinity from The Southern Baptist Theological Seminary and has served churches in Kentucky and in his home state of Alabama. K. J. met his wife, Lynn, during his first week at university. Lynn and K. J. both graduated from the University of Mobile in May 2004 and were married the same month. They’re grateful to be the parents of two precious kids, Ella (born in 2006) and James (born in 2009). He enjoys good stories, looking at maps and planning adventures for the family.